Addendum (upon second read): After near 800 pages of unrelenting despair and gloom, bombarded by a litany from any number of characters about the uselessness of life, Toll the Hounds ends on a decidedly hopeful note - yes, Anomander Rake is dead but the Tiste Andii have their god back; yes, Darujhistan has been devestated once again and many lie dead. But (if on a less cosmic but no less important note) Harllo is back with his mother, Barathol has Scillara, Picker has Blend, Chaur is safe in the Finnest House until a High Denul healer can be found, and Iskaral Pust is finding justification for two wives. And, returning to the cosmic scale of things, the Redeemer is safe, his High Priestess returned (maybe to find some solace with Spinnock Durav) and the Crippled God has been denied both the Redeemer and the power of Darkness. I sense an upcoming Ragnarok in Books 9 and 10 but if you remember the Norse myth, the end was just the beginning of a new cycle of creation. I read the first seven entries in Steven Erikson's Malazan Book of the Fallen before discovering GoodReads. So, when adding them to my shelves, I neglected to explain my 5- and 4-star ratings. 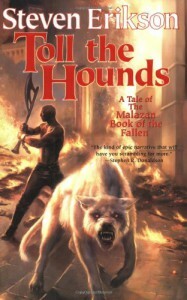 A "failing" that I intend to redress in this, my review of the eighth volume: Toll The Hounds. I'm not sure why. Perhaps I was wary of starting another "monster" fantasy series. I was frustrated/disgusted/bored by the interminable "holding pattern" that Jordan's Wheel of Time had fallen into; and, while I enjoyed Martin's Song of Fire & Ice well enough, it hadn't captured my imagination. Moreover, neither series had any characters I cared about (excepting Martin's Arya). I was rereading old favorites, which is not a bad thing by any means, but I was "hungry" for a new voice. And my prayers were answered (doubly so, as I also discovered Bakkers' The Darkness That Comes Before - from drought to flood)! In 2005, the Science Fiction Book Club had a grab-bag special or a two-for-one offer and I acquired a relatively cheap copy of Gardens for my perusal. I was immediately hooked. Here was a fully realized world with interesting characters (my immediate favorites were Whiskeyjack and Tattersail), fast paced and a well thought out physics of magic and cosmology. Erikson also had a pretty good ear for names (not great, though - some clunked like a wagon with square wheels). I was hooked, and subsequent volumes rarely disappointed. I only wish that I had discovered the series after volume 10 so I could read them all together. Toll The Hounds takes us back to Darujhistan for much of the narrative. I sympathize and understand critics who bemoan the size of these volumes (my edition clocks in at 829, about average). We appear to have returned to Dickens' day when authors were paid by the word and wrote their overwrought works to milk it for all it was worth. Erikson (and his cousins, Jordan, Martin, Rothfuss, etc.) make Tolkien's stuff read like a Fredric Brown short story. He could easily chop out 100-200+ pages in each volume without losing much in the way of plot or character development. (It's amazing, upon rereading Lord of the Rings, just how much information Tolkien could cram into each chapter, though one hardly notices.) A number of subplots could have incarnated as novellas or a collection of short stories as he did with the characters of Bauchelain, Korbal Broach & Emancipor Reese. All that aside, Toll settles a lot of plotlines from previous entries and it's clear that the series is finally coming to a climax as the Crippled God marshalls his forces to destroy his fellow Ascendants and end his pain (one way or another). It's definitely a must-read for anyone who's followed the fortunes of the Empire et al. I would also recommend the Wikipedia entries on the series as I found them to be invaluable in keeping track of characters and what had gone before without having to reread the actual books.